I'm going to go ahead and hazard a marketing-based guess that the good folks at Mazda want me to think of the 2008 Mazda RX-8 40th Anniversary Edition as the culmination of their design and engineering genius. Unfortunately, the first thing going through my mind was that the suicide-doored, rotary-engined little 2+2 is one profoundly and unapologetically weird automobile. And figuring out whether the RX-8 was the refreshing and fun Mitch Hedberg/Lotus Europa/Devo kind of weird or the exhausting and tiresome Gallagher/Citröen DS/Buckethead kind of weird was not immediately apparent to me as I tried like hell to get as far from the Brooklyn-Queens Expressway as possible. It's not fair to evaluate any car, let alone one that claims to have a personality, by driving it on the BQE, where thoughts of "Does this car work as intended?" are constantly being interrupted by looming Mitsubishi Fuso box trucks full of poorly secured bulk propane cylinders. Still, I was quickly forced to notice the RX-8's thank-God excellent brakes, the well-executed Grand Touring-style ride quality, and the fact that the engine was most certainly not making the sort of sounds I was used to or the kind of power I would have really liked. That engine (and the somewhat notchy shifter) were taking up far too much of my attention, I must admit, because despite my unusually high tolerance for weirdness, I was wondering if I could tolerate it under the hood. The RX-8's 1.3-liter twin-rotor Renesis engine has a lot more horsepower than torque, which naturally means I'm revving it pretty hard. That just adds to the stress of navigating traffic — whether it's high-speed bumper-to-bumper or walking-pace crawl. Still, it's supposedly okay, because Mazda's technological centerpiece can spin to nine grand all day. But I'd be more at ease if I was sure sure how or why that was the case. As far as I can determine (please, I beg you, hold your comments) the ingenious and decidedly weird Wankel rotary engine works by using internal combustion to bounce a fat metal triangle around inside a hollow metal kidney bean, which hula-hoops around a central shaft to generate power. Very, very smooth power, actually, that builds nicely and progressively. And before I know it, the BQE is behind me, like a long illness or a badly-planned highway, and turned into some rather nice Catskills two-lane roads. The motor is thereby transformed from a gutless liability to a forgiving instrument that rewards fluid driving, which in turn forces me to try and do some of that for a change, notchy shifter and all. Which is where I first become aware that this car just flat-out handles beautifully. The steering is about as sharp as anyone would really want in a road car, instantly responsive with feedback that stops short of becoming fatiguing. The brakes have loads of feel to balance their power. The RX-8 just sort of flows its way forward when you're doing it right, and is perfectly willing to do it all day as long as you're not asking it to do anything truly unreasonable. It's really a grand touring car, after all, and one without B-pillars in the frame, so perhaps it isn't a world-beating handler on the numbers alone. Not that anyone should care if they smile as much as I did. 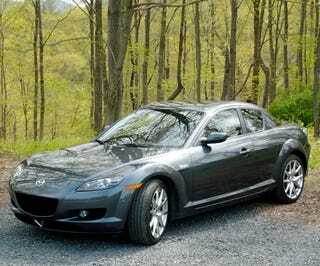 Hell, If the RX-8 does it all with a profound sense of weirdness, well, why complain? Possibly you'd complain, as I did, because the oil light began coming on intermittently. Normally I'd suspect I've holed a piston — er, warped a ring — thrown a rod — stuff not possible here. Since I'd done just enough research to scare me, I knew that these marvelous mystery motors can go through a quart of oil every 3000 miles. The rotary engine may be nearly perfected in its 40th year, but it is far from conventional. The Renesis uses an oil-injection system because of the difficulty of lubricating a Wankel, for one thing, and our test car was just (over)due for some, which I duly administered. Part of Wankelry is keeping your spare quart of 5W-20 handy, a practice both oddly archaic and perhaps even romantic, but definitely unusual. Especially because you have to unsnap the flat plastic Lego/Tupperware engine cover to check, let alone add, the oil. One way or another, that's a level of involvement that few vehicles offer. Weirdness has its price. While waiting for both the unusual machinery and my own mood to cool down, I tried out the plus-two seats in back and took notes. They seem like they'd actually be okay for a couple hours, unlike the 30-minute back seats in Mini Coopers and the like, but I couldn't see a damn thing outside the car. Which is a fine interior in good leather, accented with lots of little fat-triangle symbols of Wankelry here and there, but when I'm in a car I like to see out. I used the backseats for my duffel bag the rest of the time, getting great access through the back-hinged front-opening doors. By the way, Mazda marketing mavens have taken a page from the F-word naming convention of the brand's sugar daddy and called these "Free Style" doors instead of "suicide" doors. Displacing a wonderfully colorful term like that in a car as quirky as this is not just spineless, it's practically a crime against culture. I briefly wonder if it would be possible to find the PR hack responsible, murder him/her, and make it look like a "Free Style." Which is where I realize this car has won me over. It may be weird, but it's also an endearing, light, nimble, adequately powerful car that's a real pleasure everywhere but in the city, where it's a bit high-strung, nervous, and darty. Well, in the city streets, so am I. But on the roads I like, the RX-8 simply makes me feel like a much better driver than I am by letting me go fast without a billion horsepower and without scaring me to death. That will make a person overlook — perhaps even romanticize — a little weirdness.